There’s no doubt that most hard-working Americans like their fast food. Even though they know the bare facts – fast food is high in fat, sodium and sugar and can cause diabetes, heart disease and obesity – they still eat tons of it every year. A 2013 Gallup survey reported that eight in 10 Americans eat fast food monthly, and almost half confessed to eating it at least once a week. Ammonium sulfate is an inorganic salt used as a fertilizer and flame retardant, and it is also added to Monsanto’s Roundup herbicide. But did you know that ammonium sulfate can also be found in a burger bun? This nasty chemical has been associated with irritation of the gastrointestinal tract, diarrhea, nausea and hormone disruption. If you are a chicken nuggets lover then you are a regular consumer of dimethylpolysiloxane, also known as silicone oil. Silicone oil is a synthetic material used to make contact lenses, caulking, silly putty and lubricants. The use of this non-biodegradable oil has been decreased in breast implants due to safety concerns. Cysteine-L is an amino acid synthesized from human hair or duck feathers. It is used to flavor meat and soften bread and pastries. Consumption of cysteine-L has been linked to constipation, diarrhea, vomiting, rashes, fever, headaches, drowsiness, low blood pressure and liver problems. TBHQ, or tertiary butylhydroquinone, is a petroleum-based additive found in cosmetic products and 18 different McDonald’s menu items. Although the Food and Drug Administration (FDA) has classified this chemical as totally safe for human consumption, long-term use can result in aggravation of ADHD symptoms, stomach cancer, damaged DNA and death. Found in anti-freeze, e-cigarettes and fast food, propylene glycol can cause damage to the central nervous system and worsen existing allergies and eye and skin conditions. Researchers at the Johns Hopkins University found alarming levels of antidepressants and other prescription, over-the-counter and banned drugs in chicken feed and chicken products from fast food restaurants. Because McDonald’s doesn’t use organic chicken, their chicken products very likely contain traces of prescription medications or antibiotics. Dimethylpolysiloxane is often added to cooking oils used to prepare McDonald’s filet-o-fish, chicken nuggets and French fries. Besides being found in most fried fast foods, dimethylpolysiloxane is also utilized in the production of silly putty, contact lenses, caulking, shampoos and conditioners, breast implants, cosmetics, polishes and heat resistant tiles. Carminic acid is a red food dye synthesized by cochineal beetles. It is often added to fast food meats to give them a more vibrant and appealing color. Until 2009, carmine, cochineal extract or natural red 4, were classified as “natural dyes.” These days, however, the FDA requires carmine and cochineal extract to be explicitly identified in ingredient lists because they can cause severe allergic reactions in some people. While cellulose may be a natural product produced from wood pulp, who wants to eat lots of indigestible wood fibers? Cellulose is added to nearly every fast food item as a way to add volume. It can be found in cheese, salad dressing, muffins and strawberry syrup, among many others. You name it, and chances are wood pulp is in there. Also known as silica or industrial sand, silicon dioxide is used to make glass, optical fibers and cement. The fast food industry often adds it to meat and sauces to keep them from clumping together. In an industrial setting, workers handling silicon dioxide wear hazmat suits and masks. Nonetheless, the FDA sees no harm in adding this industrial chemical to your burger bun. Still lovin’ it? 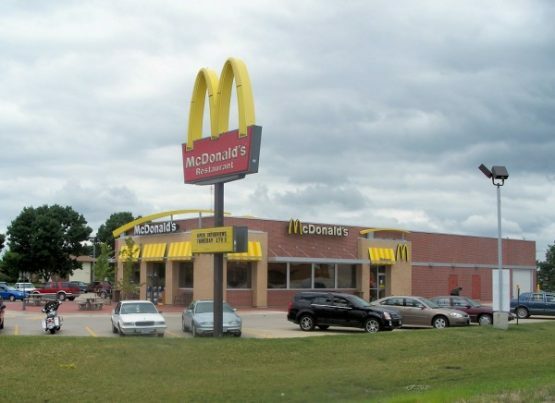 Next time you are looking for a quick meal, you may want to think twice before heading to the closet McDonald’s restaurant.